Ushahidi is from Kenya; we know how hard it can be to get connected. Those who lack connectivity are at a disadvantage to their more connected peers. Yet the equipment used to connect in Kenya or India is the same as that used in New York and London, even though the conditions are completely different. The modems used around the world were designed for the USA more than a decade ago. They assume ubiquitous electricity connection, years of fiber infrastructure, and are designed for a desktop computer sitting in an office. That scenario is outdated. It’s not the use-case for the one billion additional people who are expected to get online by 2015. At Ushahidi, we face this problem all the time, we live it. 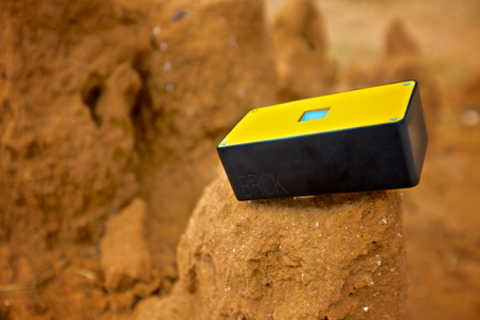 So we set out to redesign the way we connect to the Internet for the developing world, and thus created The BRCK. We learned how important it is for solutions to come from the places where the problems reside. A maker culture of problem solvers is burgeoning in the developing world. Erik Hersman is an entrepreneur, writer and speaker on the boundless spirit of technology innovation in Africa. He is the co-founder of Ushahidi, which allows users to share breaking news through text messaging, and continues to revolutionize and empower journalists, watchdog groups, and everyday people around the world. He also founded the iHub in Nairobi, the innovation hub for the technology community, bringing together entrepreneurs, hackers, designers and the investment community and built around the vision of an epicenter for Kenya’s booming tech industry. He is also the founder of the BRCK, a new connectivity device that is considered a backup generator for the internet, and is a general partner in the Savannah Fund, which does small seed investments in Africa's tech startups. Juliana Rotich is originally from Kenya where she spent her early life and schooling. She later moved to the US where she majored in IT and has worked in the industry for over ten years. She collaborated with the online community and co-founded Ushahidi which is the Swahili word for testimony. Ushahidi is a web based reporting system that utilizes crowdsourced data to formulate visual map information of a crisis on a real-time basis. She also blogs at 'Afromusing' blog, typically with a focus on African tech and renewable energy. She is a budding African Futurist, a TED Senior Fellow, a World Economic Forum YGL, and an MIT Media Lab Director Fellow. She often speaks at international conferences about tech and Africa.